The Southern Belle came to visit! YAY! Yippee! Woo Hoo! Is it possible to tell that we were excited to have our girl here for a visit? The only problem was that our son in law, Big Cat, stayed home. More on him later, but he was missed. My newly wed daughter really missed her husband. 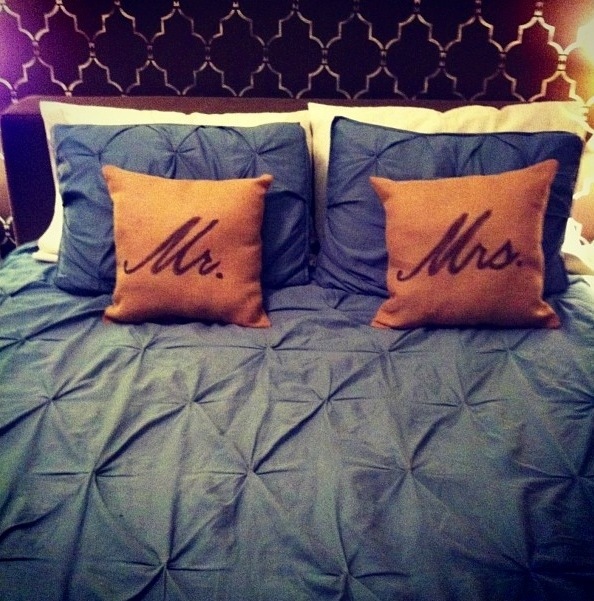 Before TSB came home she sent a photo of Mr. and Mrs. pillows asking if we could work on a set of those for her. Heck yeah. Of course. 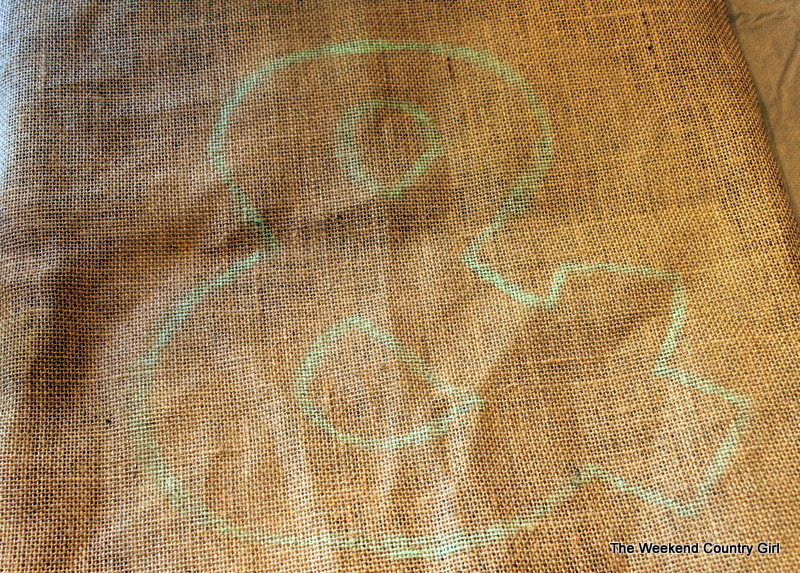 While at Hancock’s Fabric I picked up a $5.99 burlap fabric with a fairly tight weave. I got enough fabric for about 12 pillows, but only got 9 pillows sewn while Shahana was over visiting. I sewed all of the pillows by myself except two because the time ran out. Shahana whipped up the last two in a matter of minutes. Hubby and I were beyond thrilled that Baby Boy and Sweet Amanda came to spend the weekend too. My quiver was full. I love my kids. 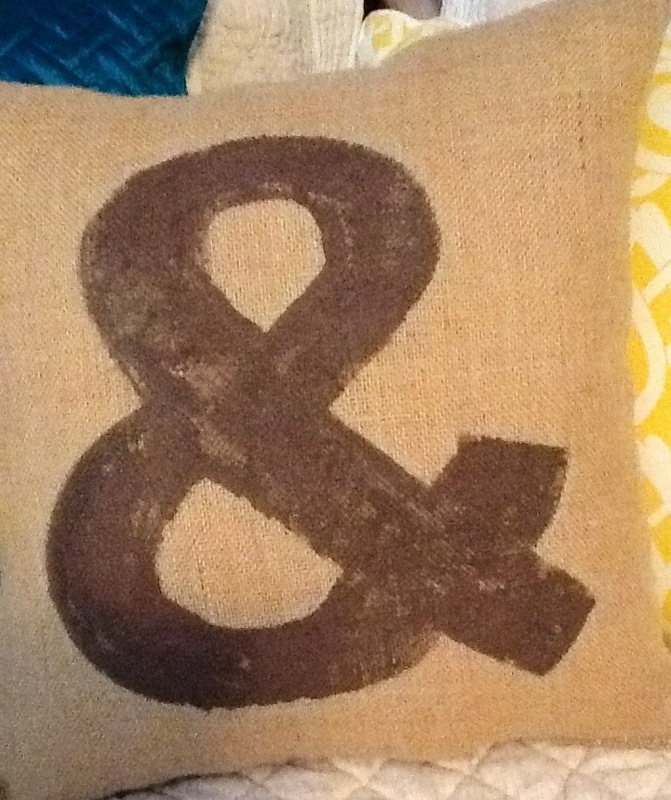 I made an & sign pillow because I thought I had enough burlap in my bedroom and wanted to make one for the guest room. The kids came, my parents came, my friends came, and my sister in law and twin nephews came over. Love it. Even with all the family, we did manage to get the pillows knocked out. Well all but one set. 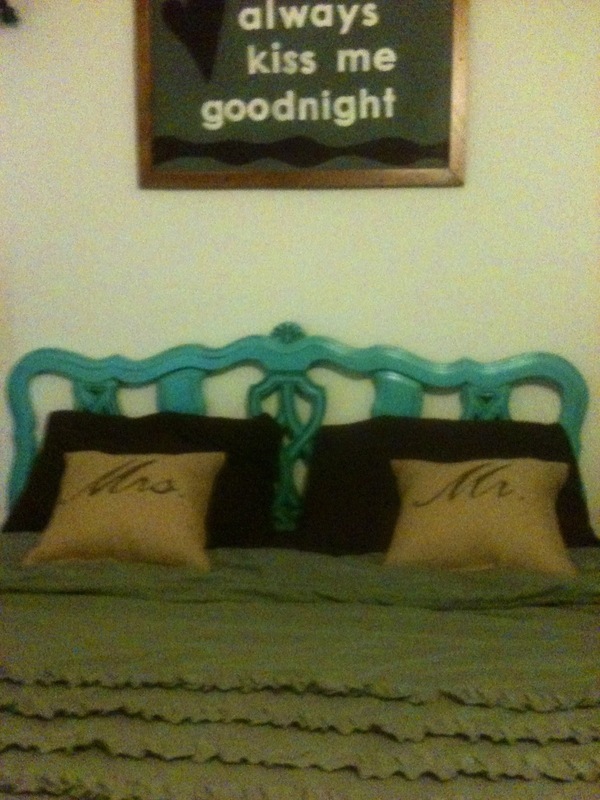 We got 3 sets of Mr. and Mrs. pillows done along with one & sign pillow for me because I already have enough wordy pillows. 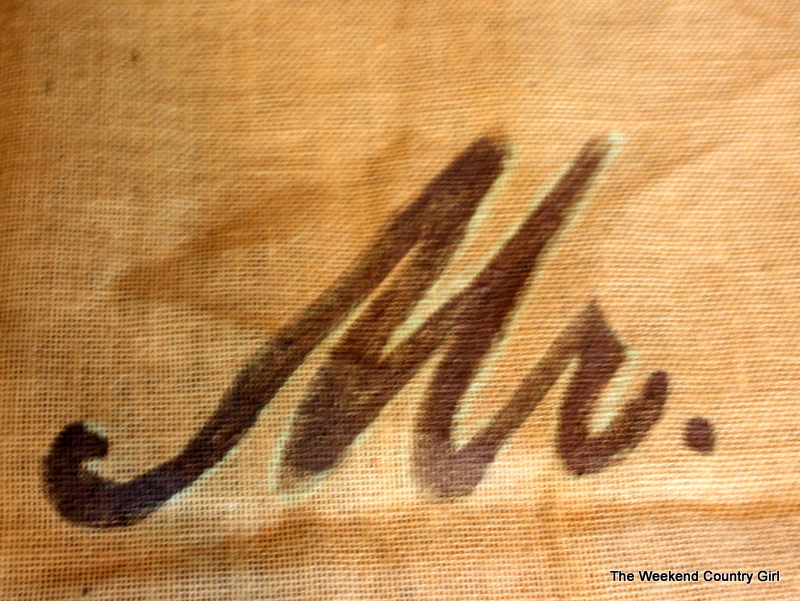 My friend and I used a borrowed overhead projector to trace out a set of Mr. and Mrs. letters onto the pillows with chalk. The chalk will brush off after the paint dries and will not show up. The girls painted the chalked letters with artist brushes. 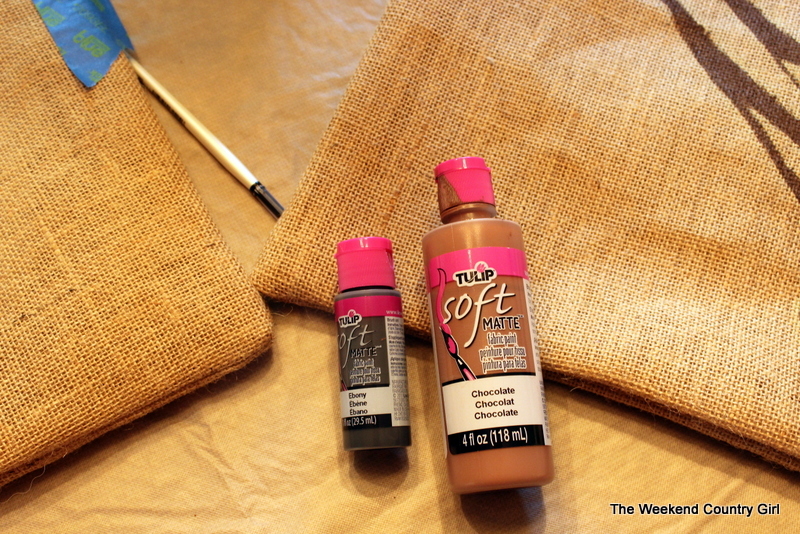 We custom mixed the paint by mixing the light brown with black to get the dark brown color we wanted. We put plastic bags inside the pillow to keep the paint from bleeding through. Just stuff then into the hole and spread them out. The chalk lines just dust off once the pillows are finished. I painted the & sign a little roughly. I was trying for the well worn look. Not sure I achieved my goal. Once they were finished painting, I stuffed the pillows and stitched up the edge. 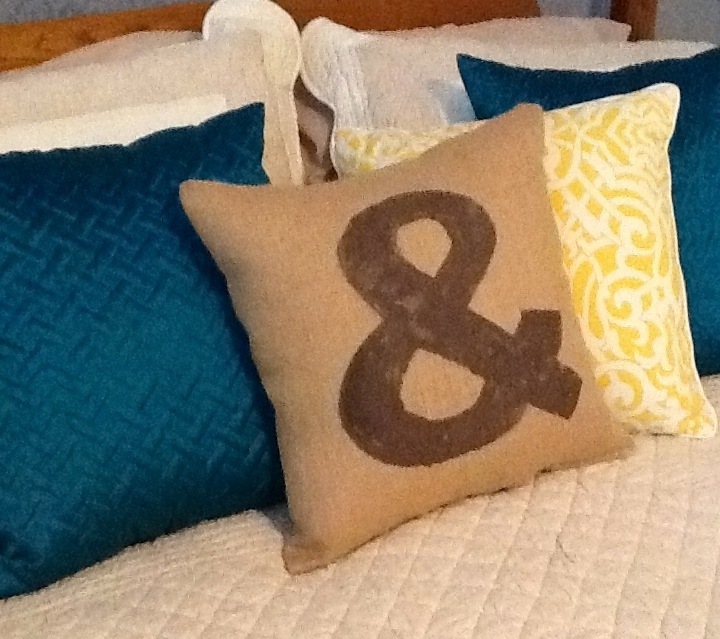 This was a super easy project and the pillows look amazing. Great idea, Belle. We now have something to remember our weekend. Here is the set done by Sweet Amanda. I need to go over and photograph all her projects soon! 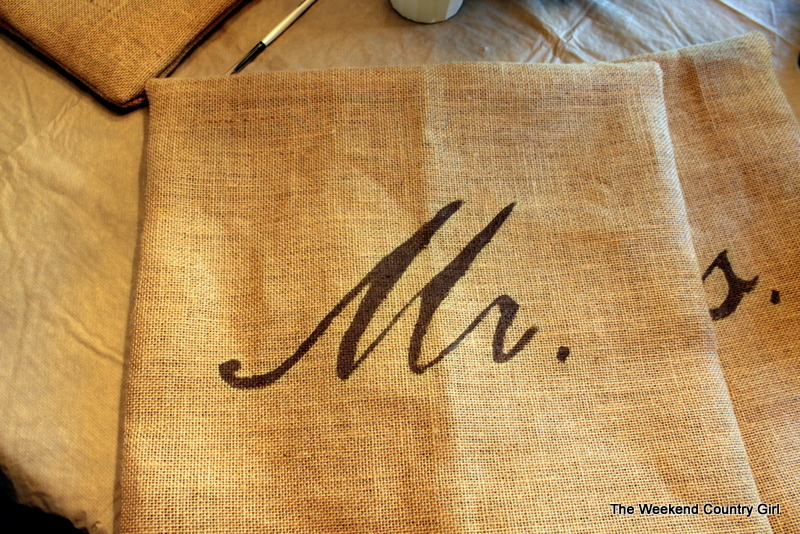 While TSB was here visiting, her sweet husband was home working on a surprise. 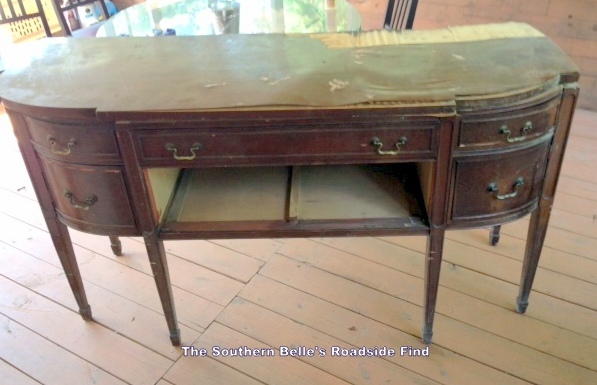 The week before she left my closet junker daughter spotted a buffet, probably from the 20’s, sitting by the side of the road. 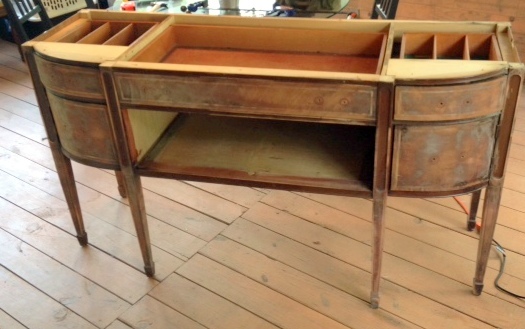 It was rough and missing a drawer, but she ( and I) liked the curvy lines and legs. Her husband, Big Cat picked it up off the roadside and took it home. During her weekend visit he worked on the piece. 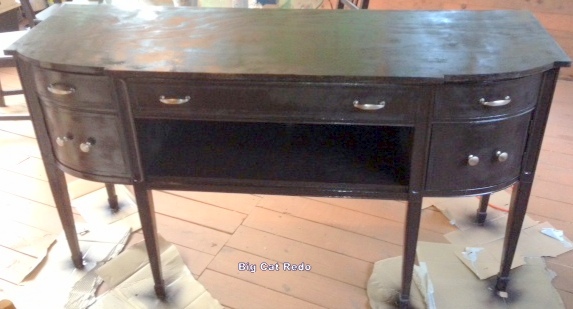 He removed the top and repaired it, sanded it down, replaced the hardware with brushed nickel and gave it a nice coat of black spray paint. 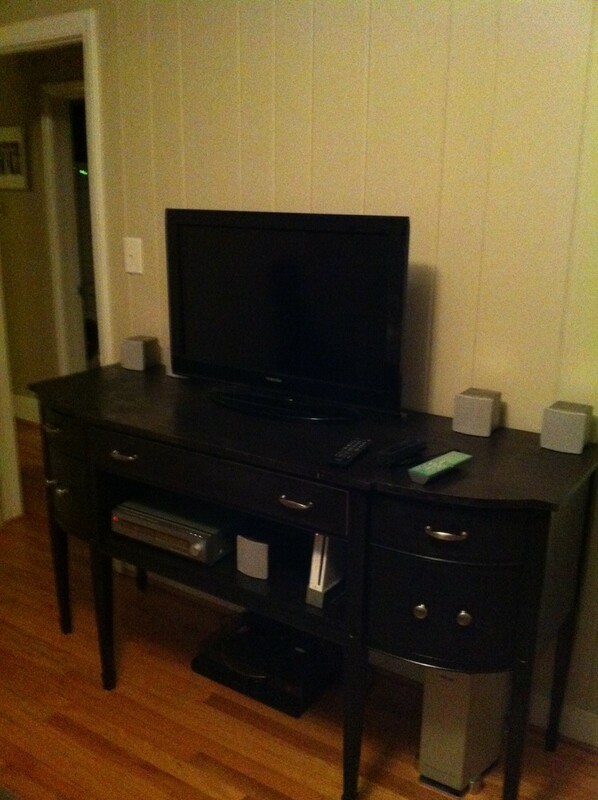 The piece is going to be an entertainment center in their study/TV room. The missing drawer spot will work great for the components. I got a sneak peek before she left for the airport from her husband via email. Good job! The finished product! Great job. I love them too. They were super easy!